New York City’s brick houses would fall apart if an earthquake the size of the one that struck in Christchurch, New Zealand in 2011 hit near the metropolis, a recent earthquake simulation found. The shake table test broke an unreinforced brick wall in half on Feb. 18 at the University at Buffalo’s Multidisciplinary Center for Earthquake Engineering Research. The 14-foot (4-meter) wall, built with materials such as 100-year-old brick, simulates the central walls of the turn-of-the-century row houses (often called brownstones) found in New York, researchers said. The shake table first mimicked powerful magnitude 5.8 earthquake waves, similar to the 2011 Virginia earthquake, rocking back and forth beneath the walls. But it took a magnitude 6.3 earthquake, which is 5.6 times stronger, to snap the unreinforced wall. Unreinforced masonry buildings account for about 80 percent of New York City’s housing and appear commonly throughout the East Coast, said structural engineer Juan Aleman, a graduate student at the university. The good news is that a similar brick wall, reinforced with steel rods and bolts as is done in earthquake-prone California, withstood the shaking. „We’re trying to understand, ‚How much better does a building perform when it has been retrofitted? '“ said Gilberto Mosqueda, a structural engineering professor at the University of California, San Diego, who took part in the test. The experiments were conducted at the UBs Multidisciplinary Center for Earthquake Engineering Research. 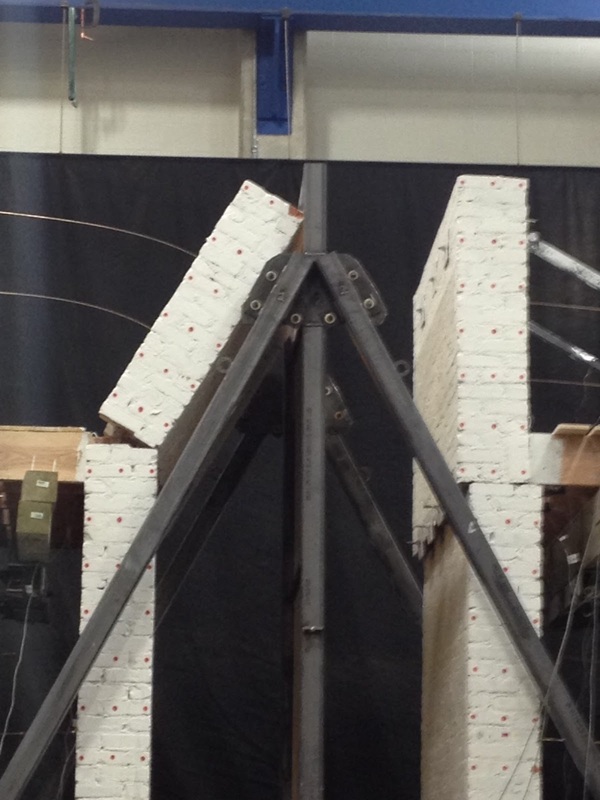 Researchers ran a number of tests to study how well reinforced masonry walls hold up in a quake scenario compared to unreinforced walls. The tests were crafted to imitate 2011 earthquakes in Virginia and Christchurch, New Zealand, which had magnitudes of 5.8 and 6.3, respectively. Researchers built two 14-foot walls: one using brick and mortar typical of 100-year-old brownstones, the same kind of materials that make up roughly 80 percent of NYC buildings, the other retrofitted using techniques typical on the west coast, where there is more seismic activity. UB research assistant Maikol Del Carpio says the retrofitted walls held up much better in the various experiments. „This could have probably killed a person. If someone was walking on the street, the parapet would have fallen down. On the other side [where] the wall was retrofitted using braces…we validated there was no damage to the parapet. So the retrofitted technique was validated, at least for this experiment,“ Del Carpio said. Researchers say the goal of the tests is to give engineers reliable tools and models for analyzing structural integrity. 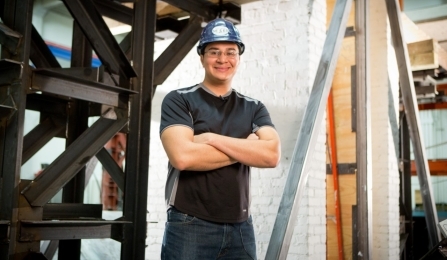 UB Ph.D student Juan Aleman says that data being collected can be put to good use by structural engineers. Researchers say while New York City is not a high seismic zone, the potential damage from an earthquake is significant due to the city’s aging infrastructure and large population. BUFFALO, N.Y. – Researchers will conduct a rare – if not unprecedented – large-scale earthquake simulation to determine how vulnerable New York’s unreinforced masonry buildings (row houses) are to temblors. Designed to imitate the 2011 Virginia quake that rattled the East Coast, the test will occur Feb. 19 at the University at Buffalo’s Multidisciplinary Center for Earthquake Engineering Research (MCEER). The time of the shake test will be set by Feb. 18. Two 14-foot-tall walls – built with materials such as 100-year-old brick – will replicate turn-of-the-century row houses (often called “brownstones”) found in New York. Researchers will use an earthquake shake table within UB’s earthquake simulation lab to mimic the Virginia temblor as if its epicenter was under the New York region. They will use the test results to calculate estimates for property loss and potential human casualties. Researchers expect the walls to fall apart and crumble to the ground. The test will occur inside a laboratory. Aleman is working with Andrew Whittaker, MCEER director and professor and chair of UB’s Department of Civil, Structural and Environmental Engineering; and Gilberto Mosqueda, a former UB researcher, who works as an associate professor in structural engineering at the University of California, San Diego. The upcoming test is collaboration between UB and the International Masonry Institute. WASHINGTON — North Korea confirmed on Tuesday that it had conducted its third, long-threatened nuclear test, provoking international rebukes, eliciting pledges of further punitive action from the United Nations Security Council and posing a new challenge for the Obama administration in its effort to keep the country from becoming a full-fledged nuclear power. Early Tuesday morning in Washington the office of the director of national intelligence, James R. Clapper Jr., issued a statement suggesting the North Koreans were, on their third try, beginning to produce nuclear devices with substantial explosive power. “The explosion yield was approximately several kilotons,” the announcement said, which was less specific than a South Korean Defense Ministry estimate of six to seven kilotons. That would be far greater than the yield of less than one kiloton detected in the North’s 2006 test, but it is unclear how it would measure up to the last test, in 2009, which had estimated yield of two to six kilotons. By comparison, the first bomb the United States dropped on Japan, which devastated Hiroshima in 1945, had an explosive yield of 15 kilotons. The test drew a crescendo of international denunciations, with President Obama calling it a “highly provocative act” that demands “swift and credible action by the international community” against North Korea. Russia, Britain, South Korea and the United Nations also quickly condemned the blast. The head of the international nuclear watchdog called the test “deeply regrettable,” and the United Nations Security Council — which has already passed three resolutions aimed at punishing North Korea for its nuclear weapons-related work, met in emergency session to devise a fourth resolution. The test is the first under the country’s new leader, Kim Jong-un, and an open act of defiance to the Chinese, who had urged Mr. Kim not to risk open confrontation by setting off the weapon. In a relatively muted statement issued several hours after the blast, China expressed its “staunch opposition” to the test but called for “all parties concerned to respond calmly.” And it was unclear how China would act at the Security Council meeting on Tuesday. Even before the North conducted Tuesday’s test, the Obama administration had already threatened to take additional action to penalize the country through the United Nations. But the fact is that there are few sanctions left to apply against the most unpredictable country in Asia. The only penalty that would truly hurt the North would be a cutoff of oil and other aid from China. And until now, despite issuing warnings, the Chinese have feared instability and chaos in the North more than its growing nuclear and missile capability, and the Chinese leadership has refused to participate in sanctions. 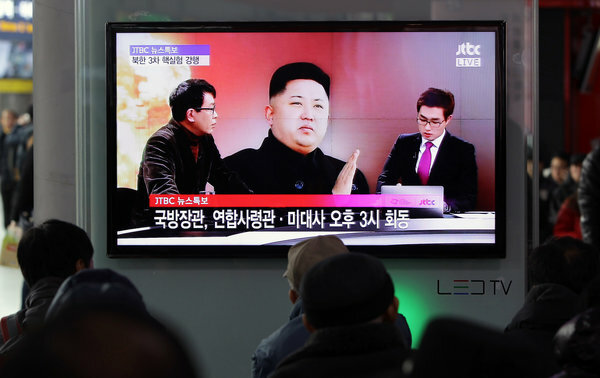 Mr. Kim, believed to be about 29, appeared to be betting that even a third test would not change the Chinese calculus, and later Tuesday, the North Korean Foreign Ministry warned of “second and third measures of greater intensity” if Washington remains hostile. The test set off a scramble among Washington’s Asian allies to assess what the North Koreans had done. The United States sent aloft aircraft equipped with delicate sensors that may, depending on the winds, be able to determine whether it was a plutonium or uranium weapon. The Japanese defense minister, Itsunori Onodera, said Japan had ordered the dispatch of an Air Self-Defense Force jet to monitor for radioactivity in Japanese airspace. Mahmoud Ahmadinejad declared that Iran is a nuclear power and should be treated as such in an interview with an Egyptian newspaper on the eve of his visit to Cairo. But the Iranian president said his regime has no plans to use that capability for an attack on Israel. 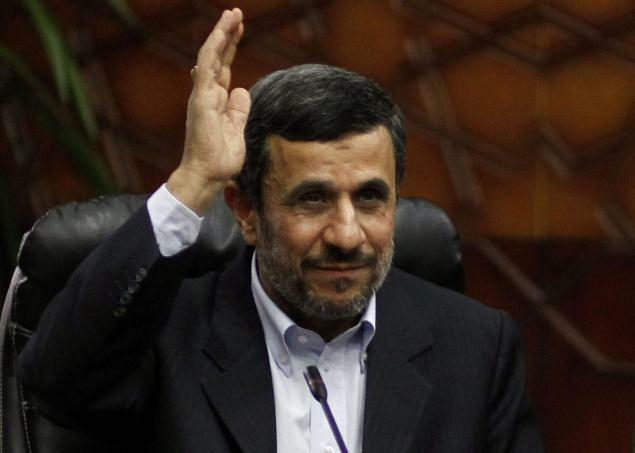 Ahmadinejad is in Cairo for the Islamic Summit Conference, which opens Wednesday. His visit marks the first trip to Egypt by an Iranian leader since 1979. The two nations have grown closer under Egyptian President Mohammed Morsi of the Muslim Brotherhood. President Obama has vowed he will not allow Iran to become a nuclear state. Iran has been subject to punishing sanctions by the U.S. and allies over its nuclear program, which Iran claims is peaceful. On Saturday, Vice President Biden said the U.S. is open to direct talks with Iran on the dispute. “We must ensure development and growth and bring them to pass, and the world must acknowledge our progress,” he added. In Ahmadinejad’s remarks about Israel, he cast the Jewish state as the aggressor and said Iran is focused on protecting itself. “They want to attack Iran, but we’re not preparing any attack against them because the purpose of our program is defense,” he said. But he also warned Israel about its treatment of Palestinians. The Iranian leader said his country also opposes any outside interference in the ongoing slaughter in Syria by Bashar al-Assad’s regime. On Tuesday, Ahmadinejad was forced to flee an ancient mosque in downtown Cairo after a Syrian protester threw his shoes at him – a traditional sign of disdain in the Arab world. New York officials have dismissed the threat of earthquakes from drilling activities as they develop state rules for shale gas drilling and hydraulic fracturing, but a New York-based seismologist says that’s a bad idea. „This is a hazard that needs to be recognized and thought about when you’re looking at regulating these activities,“ said Geoff Abers, associate director for the Division of Seismology, Geology and Tectonophysics at Columbia University’s Lamont-Doherty Earth Observatory in the New York City suburb of Palisades. Abers is part of a research team that asserts a November 2011 earthquake east of Oklahoma City was „likely triggered by fluid injection“ (EnergyWire, Dec. 3, 2012). Their paper on the subject has been accepted for publication in an academic journal. The magnitude-5.6 quake injured at least two people, damaged 200 structures and destroyed at least 14 homes. Lamont-Doherty, where Abers works, investigated an earthquake in Ohio that has prompted new rules for injection wells. Oil and gas industry officials are dismissing his warnings as the product of an anti-fossil fuel agenda at Abers‘ institution. She noted Lamont-Doherty is part of Columbia’s Earth Institute, which states its mission as „Solutions for sustainable development.“ Sustainable development, she said, indicates „a fairly negative view of fossil-fuel development.“ She also noted that Abers has no background in petroleum geology. He has a doctorate in geophysics from the Massachusetts Institute of Technology. In an interview, Abers said his criticism is not based in opposition to drilling. He wrote in his op-ed piece that „Clearly, fracking brings great benefits.“ But he said there needs to be a clear understanding of the risks. Moreau said the rules being drafted by New York state’s Department of Environmental Conservation are for drilling and hydraulic fracturing, not the wastewaster disposal injection that has been linked to earthquakes. She said any such wastewater from high-volume fracturing would likely be shipped to injection wells in other states. Injection wells regulated under oil and gas law are deemed „Class II“ wells under federal rules. There are 481 such wells in New York, according to an EPA inventory. Most are likely for „enhanced oil recovery.“ An EPA spokesman said six are oil and gas wastewater disposal wells. New York’s DEC and U.S. EPA both play a role in regulating the disposal wells. The state requires permits for any such wells deeper than 500 feet, and the regulations New York is working on cover the state’s role in regulating disposal. EPA regulates the wells under the Underground Injection Control program of the Safe Drinking Water Act. „There is essentially no increased risk to the public, infrastructure or natural resources from induced seismicity,“ state officials wrote in responses to public comments about the agency’s draft regulations. But geologists have known for decades that deep injection of industrial waste can lubricate faults and unleash earthquakes. One of the most famous instances of man-made earthquakes, or „induced seismicity,“ occurred in the late 1960s at the Rocky Mountain Arsenal near Denver, where the Army manufactured chemical weapons. Most seismologists agree that the specific process of hydraulic fracturing presents little or no risk of triggering earthquakes that damage property or injure people. But fracking and production of shale gas produce millions of gallons of wastewater far saltier than seawater and laced with toxic and even radioactive chemicals. Some can be reused, but eventually, what comes to the surface must be disposed of. Even with shale gas production blocked by a moratorium, the state’s conventional wells produced about 24 million gallons of water along with oil and gas in 2011. Abers noted that the state doesn’t allow filtering the water through public wastewater treatment systems, and officials have indicated that storage in open pits won’t be permitted. That leaves spreading it on roads, deep underground injection in New York or trucking it out of state. USGS and other scientists have blamed a „remarkable increase“ in the number of earthquakes in the middle of the country on oil and gas drilling activities, particularly disposal of the „brine“ waste from fracking and drilling (EnergyWire, March 29, 2012). There are about 40,000 brine injection wells in the country. Very few of those have caused earthquakes. But in the drilling boom of the last few years, earthquakes have been linked to injection wells in Arkansas, Colorado, Ohio, Oklahoma and Texas. Arkansas and Ohio oil and gas officials shut down injection wells that were linked to the seismic ruptures. One company shut down its injection wells near the Dallas airport after scientists linked them to small quakes. Under federal environmental law, it is not illegal to cause an earthquake. And oil and gas disposal wells are exempt from the construction standards designed to prevent industrial waste injection wells from triggering earthquakes. States can have rules to address earthquakes from injection of oil and gas waste. But aside from Ohio, which adopted rules last year after a series of quakes around Youngstown, most don’t.